The DG Series is an excellent, economical solution for tensile or compression testing up to 500 lbf (2.5 kN). This force gauge can be used as a hand-held device or equipped with an optional handle set for two-hand operation. The Chatillon DG Series is a low cost force measurement solution, ideal for a wide range of force testing. DG Series mechanical force gauges features a 2.25-inch dial and a peak hold button for capture of the peak readings and an easy return to zero. The concentric dial measures clockwise only and rotates 360 degrees for taring. The DG Series comes with a universal mounting plate, and a mechanical overload feature protects the force gauge from damage. 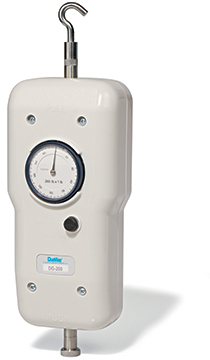 This mechanical force gauge has an accuracy of +0.5% of full scale, and can be used as a handheld force gauge or equipped with an optional handle set for two-hand operation. When combined with the MT500 Series mechanical test stand the DG Series provides a versatile, economic test system with a capacity up to 500 lbf (kN). Find out which adapter you need for your DG mechanical force gauge in this Connection Diagram. Find the Declaration of Conformity for the DG Series mechanical force gauge here.